before I can ask him if this is the latest credo of the administration he asks me “Does he bite? He looks like a puppy, how old is he? Does he know tricks?” Harpo is wagging his tail. Mostly it’s women and girls who just can’t pass him without coming over and saying Hello. “He is such a nice puppy.” I let that pass because I am getting tired of explaining that he is almost three and not a puppy any more and that he is maybe a little small but lean instead of fat which still does not make him a puppy. I’m not nervous, but I watch the situation closely. 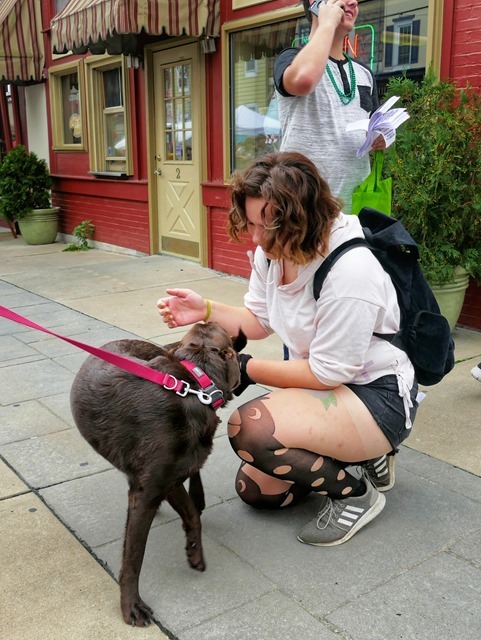 This is the first time that we get to see and meet black people in a noticeable number and the reaction of dogs isn’t always reliably predictable. With squirrels for examples Harpo derails totally but now he is okay. It’s a little like in the old country song “you never can tell”. A story comes to my mind a friend told me some time ago. He had to move I believe from California to one of the northern states. At the time he had a dog which he didn’t want to take with him and so he gave it to a friend. A week later he got a call from this friend who complained about the dog. „Nothing“, my friend said „he’s always been that way. He’s a German Shorthair. What do you expect from him, being German? Not so Harpo. He treats all of his admirers alike, doesn’t bark at neither white nor black, is friendly with everybody and apparently has a very good time. And everybody else with him.